Those rare occasions pop up when I wonder if I should try my hand at reviewing movies. Unfortunately, the only movie I could probably review would be "U.F.O." After that, my cinematic analysis abilities would quickly deteriorate and the world would be a worse place because of my attempts, so I'll leave movie critiques and TV show history to those who do what they do very well. That brings me to Canadian writer Mark Phillips. In 2002, I received an e-mail from Mark, who was in the process of researching a lengthy piece he would write for the magazine, TV Zone. His project concerned the old British TV series, "UFO," a fictional sci-fi serial which had nothing whatsoever to do with the 1956 documentary movie you've read about here. In 1973 I had written a letter, published in TV Guide, very critical of the TV show, and though my letter's existence had been long forgotten in the cobwebs of my mind, here it was, almost 30 years later, and Mr. Phillips not only had retrieved this antiquity during his research, but managed to locate me as well for a few comments to add to his excellent article, eventually printed in issue no. 154 of TV Zone (2002). During our initial e-mailing, Mark and I also realized we were both fans of the old U.S. TV show, The Invaders, starring Roy Thinnes. For my part, I was always intrigued especially because Thinnes' character ("David Vincent"), though fictional, reflected a very significant part of real UFO history -- the representation of a UFO witness who couldn't get an uncaring and/or unwilling public and various officials to hear his warnings or pleas for help and understanding. The TV series traveled a rocky road before its ultimate cancellation, but remember -- this was a program whose theme of man vs. ignorance about UFOs appeared long before the movie, Close Encounters of the Third Kind, which was all about what we might call the two-ton elephant in the living room that nobody wants us to see or even know about. Mark Phillips continued researching The Invaders and I'm happy to report that his comprehensive article and super visuals appear in the new issue of Starlog for March, 2009 (no. 373). His piece is entitled "Secrets of 'The Invaders,'" and the issue's cover is shown here. Of considerable interest to me is a passage where Phillips quotes an Invaders associate who notes that the series failed with viewers over age 50 because, "The show scared the hell out of them." Hmm. Maybe it's true, if adults can't deal with TV tube fantasy, maybe some circles felt that we really can't handle the truth about UFOs, either. Did the U.S. government take a tip from The Invaders in keeping UFO evidence under the public radar? A brief and illuminating e-mail about the late Dewey J. Fournet, Jr., arrived a few days ago. In the early 1950s Air Force Major Fournet monitored the government's UFO investigation and became convinced of the UFO issue's importance to science and national security. His letters to me from the 1970s are posted in my blog concerning the 1956 movie, "U.F.O." and I've mentioned him on occasion in my regular UFO-related blog, and of course his name is legend concurrently with Capt. 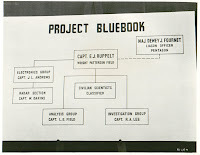 Edward J. Ruppelt and Albert M. Chop in UFO research history. "My name is Kim Bergeron, and I’m the godchild/niece of Dewey Fournet, Jr. (my mother’s brother). I’ve recently purchased the UFO movie in which, I understand, my uncle was portrayed. . .
"One of my fondest memories of my uncle was a conversation we had when he knew he had precious little time left on this earth — for the first time ever, I asked him point blank if he believed that U.F.O.’s may really exist. "I only wish now I’d asked him that question many years earlier, so he could have shared more stories from his many years of investigating such." You probably know by now that one of my major annoyances related to publicized UFO sightings is the well-established fact that members of the press usually fall over themselves to locate some local professional or amateur astronomer who can tidily explain the whole thing via a nicely contrived package deceptively resembling science. Or, to be more specific, the chosen "expert" stands there before the cameras and microphones, having conducted no investigation whatsoever, and assures one and all that a meteor or a flare or the moon or Venus or a cloud or an airplane or a satellite or illuminated cow flatulence or any conventional explanation that comes to mind is responsible for the incident. Then, more often than not, heavily sedated with words of authority, the ladies and gentlemen of the press hurry away to prepare for News at Eleven, fully willing to report a lie as the truth -- often encouraged by their editors, who have neither the time nor patience to entertain "saucer" stories as anything more than a momentary amusement to keep viewers tuned in. How I long for investigative reporting the way it once existed, especially in those things currently on life support called newspapers. It's no wonder that a few months ago I entitled one of my blog entries, "When Journalists Roamed the Earth." So today I'm plowing back through history. At some point after patrolman Lonnie Zamora's famous 1964 observation of a UFO and small entities in the New Mexico desert, and sometime after thousands of people in several western and mid-western U.S.states reported UFOs in 1965 -- subsequently "explained" by the experts as bright stars which, it turned out, were only visible from the other side of the earth at that time -- and not long after the Michigan "swamp gas" (more accurately marsh gas, per Wendy Connors' research) UFO reports of 1966, a little recording history was made: A record album (LP) about UFOs enjoyed a release. Oh yes, there had been other UFO-related LPs in the sixties, the best-known of them being former Mutual radio network broadcaster Frank Edwards' narration from his best-selling book, Flying Saucers: Serious Business, and that was released in 1966. In fact, while the UFO subject was still hot property in 1966, another famous broadcaster-of-the-strange-and-unknown, Long John Nebel, likewise released an LP entitled, The Flying Saucer Story, containing excerpts of his radio interviews with Edwards, Major Donald E. Keyhoe (USMC, ret.) and, for something totally different, with famous contactees whose wild tales about trips to other planets aboard flying saucers served only to distort the truth about real UFO incidents. More LPs about UFOs followed in the seventies. But in 1967 there came about another LP, the audiologic horse of a different color. From California's Morrison Planetarium, prepared and cooked up via an entirely non-traditional science recipe, the public was offered an LP entitled The UFOs. Labeled as planetarium lecture series no. 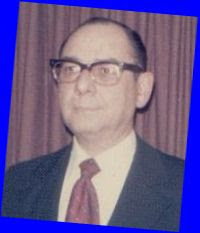 3, lecturer Hubert J. Bernhard narrated for the LP a lengthy history of UFO observations from biblical times to the present. However, the most impressive and perhaps incredible aspect of Bernhard's presentation was the unencumbered possibility that UFO evidence may represent extraterrestrial spacecraft! Trust me, in the vast majority of cases your local astronomer won't be offering a lecture of this nature. Nowhere near! Bernard offered no excuses, apologies or hesitation as he walked through history with references to UFO incidents all the way. 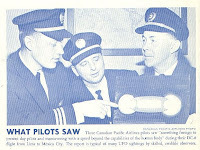 In fact, as you can see in one of the visuals posted today, the record album even displays a photo showing three Canadian airline pilots who experienced an interesting UFO encounter. Other scans here will give you an idea of what was featured on the front and reverse sides of the album jacket. The UFOs is an immensely scarce album, and I would love to believe that all remaining copies were snapped up by skeptical astronomers forced to rethink their positions on the UFO issue. However, the fact that something of this astonishing nature ever saw the light of day, after miraculously given birth by planetarium authorities, is almost beyond belief by today's disturbing standards of professionally sanctioned scientific ignorance in various pockets of society.